Problems come in all shapes and sizes. Obviously it would be too expensive to apply the most complex solution process to every problem. It is best to start with a simple process and escalate if needed and if justified. This is obvious and sounds simple. But in most cases people in different parts of the organisation handle situations differently and make different decisions about what is justified and expected. This is undesirable because in some cases money is wasted on doing work that is not justified, while elsewhere issues that are of high risk to the organisation are not properly recognised and treated. It is important that organisations communicate to personnel what is appropriate and how communication channels should work. Many organisations have risk matrices that are intended to help people make decisions but too often they are not integrated in a way that makes them useful or meaningful. Nobel prize winner Daniel Kahneman found that most of the time, probably more than 98% of the time, people use their experience and intuition to solve routine tasks. This is a good thing because it is fast and generally delivers appropriate results, particularly if people have the opportunity for training. Occasionally something will happen where experience does not deliver the desired outcome. In this situation it is desirable to stop and make a conscious decision to use a different, more analytical approach. Kahneman calls this “slow thinking”. But at this point it is desirable to “keep it simple”. Too often organisations go to an overly complex approach and get bogged down as too many resources are wasted. It is best to encourage people to initially try the 5WHYS process for several reasons. It is surprising how often this incredibly simple approach actually solves the problem and provides an adequate remedy. Registering the issue as a “5 Why” gets it into the collective memory. Too often small problems are shrugged off as unimportant, but if they happen every day to different people then they add up. In thinking through the 5 whys a person can make an initial judgement about the “risk” associated with the issue. Registering this helps to surface issues that might otherwise be overlooked. A person who has applied the 5WHYS and has thought about the risk is well placed to confirm the problem is contained appropriately so that no other negative effect can happen. The 5 Whys are like First aid or triage. They almost always help and most of the time they produce a solution that is satisfactory. The risk is also assessed and the importance of the issue can be recognised so that the organisation can manage the problem in an appropriate way. In organisations where a team might be in contact with the issue then the 5WHYS would develop into an A3 exercise where the team would use the tools in the A3 process to collectively augment the 5WHYS. If the problem persists then consider the risks to prioritise and see whether additional resources are justified to upgrade the solution process to a full Root Cause Analysis of Focus, Find Causes and Fix Forever. It is important that the approach and processes underlying the 5WHYS, A3 and RCA process are integrated so that all of the valuable information gathered by the “first responders” flows into the full RCA. Focus on developing a clear understanding of the problem. It is surprising how often the act of rethinking the problem definition reveals the causes and solutions. It is important to confirm the problem is contained to ensure that no harm is done because it may take a while to identify the best solution. Find Causes. This phase seeks to identify possible causes. The use of evidence is fundamental to establishing which possible causes were active. The cause tree is a very useful way of showing relationships between causes. The tree shows the different ways that the issue may have happened. The tree also shows how causes and other factors may work in combination so that an event may only happen under certain conditions. Fix Forever. It is often the case that the cause of an issue is unknown at the beginning. But by the “Fix Forever” phase it is common that there are several solutions. The “Fix Forever” phase works through the process of identifying the best solution and providing a management process to ensure the solution is implemented properly. Remember, keep it simple and be ready to escalate if the risk justifies the resources. All of this can be done manually using slips of paper and white boards. But in a world where everyone has a smartphone then mobile friendly software makes it so much easier. Apply for a free trail of the software at www.rca2go.com. Did you know RCA2GO software comes with Human Factors module? Try it yourself! 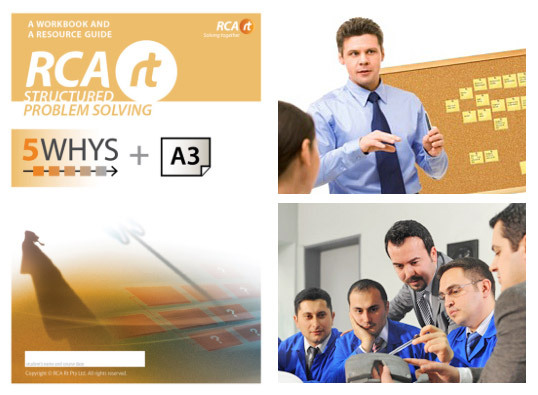 We at RCA Rt Pty Ltd develop RCA Rt structured problem solving method, which is complemented with RCA2GO, a web-based rich software toolbox and issue management system available anytime, anywhere. Endless scalability in RCA Rt and accessibility of RCA2GO software empowers your entire team to solve and improve together. © Copyright 2007-2017 by RCA Rt Pty Ltd.